There were some hot times going down at Holmdel Park on Tuesday during Monmouth County Championships. 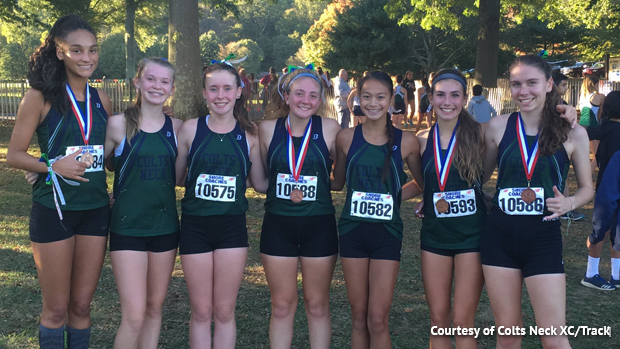 Madison Brand and Brian Hill both hit major course personal bests to win individual titles, Christian Brothers Academy continued their 16 year streak, and Colts Neck girls won their second straight title. The girls race was won by Middletown South senior Madison Brand, who obliterated her previous course best of 19:48, when she crossed the line with a 16 second lead at 18:39. That shot Brand up the rankings to #2 on the state course this season only behind Monica Hebner's 18:32 from Shore Coaches. Matawan's Rachel Kenny also broke 19 minutes with her 18:55 for second, ranked fifth on the course this season. 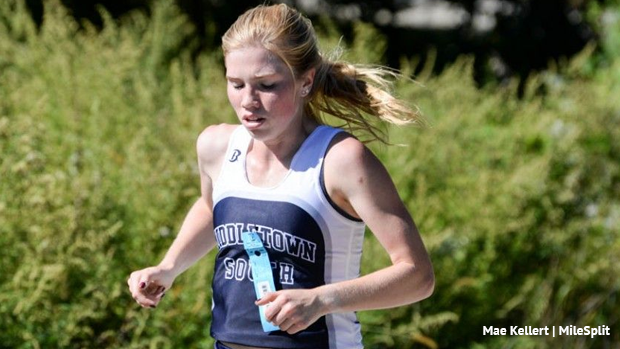 In the team battle Middletown South scored early thanks to Brand's one card and Kathleen Shay finishing fifth at 19:35, they totaled 75 points after scoring 1+5+18+25+26. However Colts Neck had other plans and battled back with a 4+6+7+9+35 top five for 61 points and 19:53 average to win their second straight county championship. Colts Neck's leading scorer Colleen Megerle finished fourth overall at 19:20 after a battle to the line with Monmouth Regional's Amanda Stone who finished third with 19:19. From there Colts Neck's Natalie Shapiro finished sixth at 19:39, Delia Russo seventh 19:41, Eva Gibson ninth 19:48, and Lucy Gardner 37th 21:00. For the Boys Championship CBA made it 16 straight, winning this year's title with 56 points and an average of 16:32. The win came off a 1-2 punch by Brian Hill and Ryan Miele who led the race with a 16:02 and 16:06, both are strong course PRs and broke them into the top four at Holmdel this season. The scoring line for CBA came through with 1+2+14+16+23; after Hill and Miele it was John Sheridan 14th at 16:41, Justin Durney 16th 16:47, and Nick Rienzo 23rd 17:07. The Colts haven't lost a Monmouth County title since 2001 when Red Bank Regional ended CBA's previous 19 year run which started in 1982. Drew Maher of Shore Regional, 16:11, Tyler Schwinn of Red Bank Regional, 16:16, and Louis DiLaurenzio of Raritan made up the rest of the top five individual finishers. Colts Neck boys finished second behind CBA with 105 points and a 16:57 average.